If this condo shows as unavailable for the time you like to come, please check our other listing with Home Away #980424. If your are here for 4th of July you may see unobstructed view of the fireworks from this condos balcony. Beautiful Marco Island Gulf beachfront corner condo with WIFI inside the apartment at the South Seas Club with wrap around balcony, southwest exposure, and direct access to the beach, next to the Tigertail state park. It has one of the most panoramic views at the entire Marco Island beach. From a 300 square foot long wrap around balcony on the 10th floor you overlook the Gulf of Mexico, the 5 mile white sandy crescent beach from tip to tip, the state nature preserves, a large heated pool, and the lush Marco Island skyline just beyond Clam Bay. Step outside from the living room or either bedroom to the lanai and absorb the beauty this corner of paradise has to offer. By day, you will see nature all around, diving pelicans, jumping fish, and sometimes playing dolphins. Late afternoon you will witness magnificent sunsets and feel a pleasant breeze coming off the warm gulf waters; later in the dark you see even from the inside a beautiful lit condo skyline toward the south. 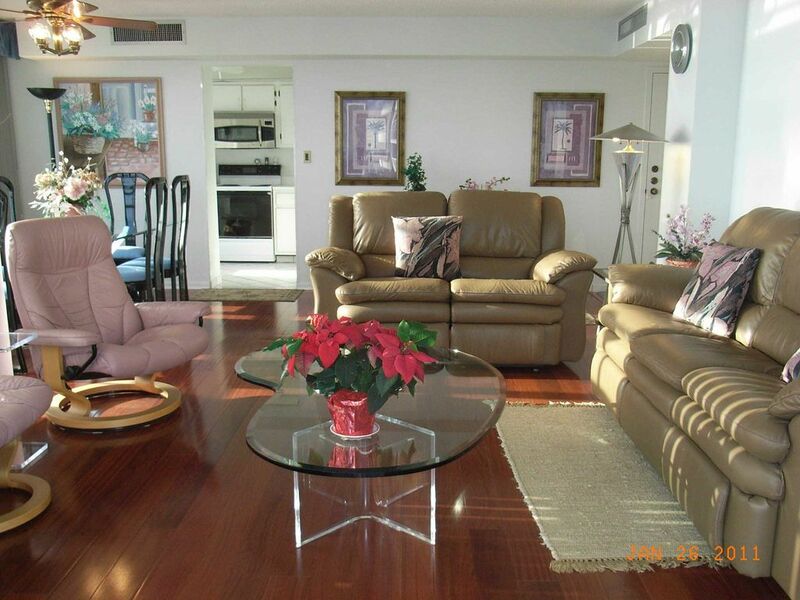 - Inside the condo you may relax in roomy, updated and comfortable accommodations. The living room got bran new Hurricane windows, rich Brazilian Cherry hardwood floor, two new leather sofas with recliners, and also a new 46' LED widescreen TV. You may want to dine at one of the many fabulous restaurants or just stay home and sit at the dining room table for dinner while gazing outside at the water and bypassing boats, and also watch from inside beautiful sunsets. Floor to ceiling sliding doors are leading from each room to the 50 by 6 foot tiled and furnished lanai. This corner unit is a truly relaxing retreat. (All surrounding pictures are views from the lanai). - Sorry, the association does not allow smoking and any pets inside the apartments and condo facilities. - You may stay less then 7 nights for the minimum cost of the weekly rate. Dressing area between master bathroom and private shower room. 7'x5'9' walk-in closit in dressing area - master bath Wall closit in dressing area - master bath. Both bath rooms and dressing area are entirely tiled. The condo association recently added at Pickle-ball Court to the property for your enjoyment. View entire Marco Island beach including sunsets from south tip to north tip from wrap around balcony and inside apartment through sliding door toward south and large windows toward west. Nice walking areas within the entire condo complex. Boat docs available for rent. Tennis courts; large heated outdoor pool. Another excellent Marco Island vacation! This was our first time staying in South Seas after coming to the island for over 30 years. The condo was very clean and more than enough space for our family of 4. Some things are outdated and could use an update (ie, towels), but I would stay here again in a second. The view was amazing. The location was perfect. Thanks for sharing your slice of paradise with us! We spent 2 weeks in this perfectly located condo! We didn’t mind the walk to the beach at all, but a few new beach chairs and beach cart with the large wheels would be helpful. We hope to be back next March! The condo was inviting and equipped with everything we needed. The best part by far is the wrap around deck, giving spectacular views. Worth every penny. The pool and the grounds very well maintained! We were disappointed that it was such a long walk to the beach, but did not deter our good time. Working with this owner was a delight. She supplied us with all information needed about the condo & the building. Any question or issue was addressed quickly. We would not hesitate to go back! A great location with comfortable furniture and beds! Beautiful views day and night. Close to great restaurants and shopping. If your looking for a Gulf front location in the Marco and Naples area, this is your place to escape and relax! A very homey and relaxing southwest view of the gulf, this condo is extremely well kept and quiet. The owner was very accommodating and easy to work. We would recommend this stay for anyone who wants direct beach access in a private setting..
Great location for a nice quiet relaxing break. We found some nice local restaurants around Marco Island. Marco Island, FL, offers a wonderful array of activities. From the convenient supply of beach activities right outside the condo door to the many recreational and educational opportunities in the area. There are championship golf courses nearby, as well as boating, shelling, fishing charters, parasailing, jet skis, sailing, snorkeling, and scuba diving. The Everglades National Park is just around the corner, where you can enjoy museums, swamp buggy rides, air boat rides, and excursions. There is an endless choice for entertainment and restaurants in and around Marco Island, FL. From live entertainment at the Naples Philharmonic and the local player in both Naples and Marco, to the 20 theater complex in Naples or the Marco Movies where you can enjoy your dinner while watching the latest movies. The romantic fishermen town of Goodland with excellent restaurants and night entertainment is only a few miles away. Shopping is taken to a new level from the many quaint shops in Marco to the upscale shopping on Fifth Avenue in Naples. Outlet shopping is available right off the Island at the Prime Outlet Mall and if you want something larger, there is the Miramar Outlet Mall in Estero, about a 30 minutes ride.